It’s winter and you want to go skiing. When you get to the ski resort you notice that the ski lifts haven’t been built yet. To your surprise, a giant globe appears in the sky and starts to place wood, steel, and cable right in front of you. Fortunately, you’re second in line because it’s still the tutorial and the first go-round fails miserably and you watch the skier in front of you fall to a bloody death. You take a deep breath. Fortunately, the tutorial is over and the player builds you a perfectly stable ski lift and you cheer as you start your run down the mountain. Much like past games like Bridge Constructor, your job will be to place anchors on the ground and build up the structure in such a way that it doesn’t crumble beneath the weight of a few ski chairs. What sets this game apart is that you also get to build jumps for skiers and snowboarders to launch them into the sky to try to reach points and progress to the next level. But it doesn’t stop there. You also get to control skiers and even snowmobiles to get them to the goal in certain levels. This is a nice addition because let’s face it; building stuff up can get a little redundant and boring after a while. 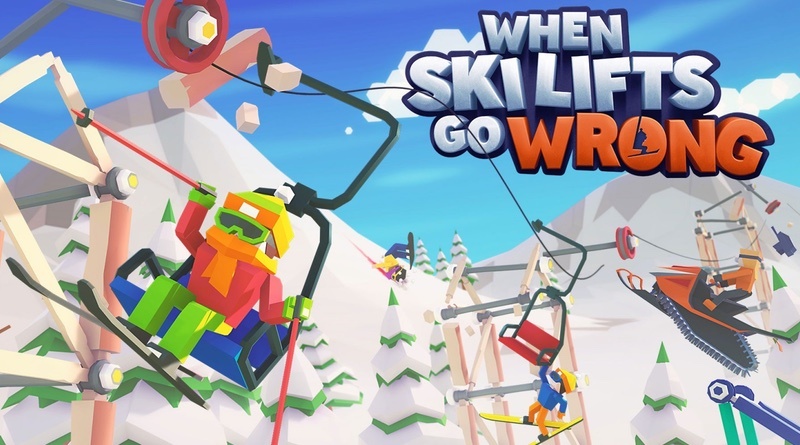 Mixing it up with these levels really sold me on the idea of When Ski Lifts Go Wrong being a solid title for the Switch. I have spent quite a few hours with other structure games like the aforementioned bridge building game. There are a few features that I found to be not only helpful, but now that I’ve used them, downright necessary. You can select an option to automatically mirror and attach structural pieces to contact points. Add to this the introduction of belts that you can use to speed up the velocity of your skier for a ski jump and the incredibly easy method of attaching the ski lift cable and you have a wonderful experience solving the problems introduced in each level. The tutorials did a pretty good job of explaining how to do what you need to do throughout this puzzle title. There were a few times where these tutorial messages weren’t very clear. As an example, when it was time to teach the player about the use of these ski jump belts, they tell you to hit left on the directional pad to adjust the direction and speed of these belts. They don’t tell you that you don’t need to have your cursor on the actual belts, but in my head it seemed like the thing to do. I would highlight the belt, hit the left direction, and adjust the belt and then move on to the next one. As soon as I hit the left direction, the first one reset. I couldn’t get it to set all three until I did NOT highlight one of the belts and it magically adjusted all three of them. Sure, that’s most likely my own brain adding a step that was clearly not in the instructions, but I felt I should mention that some of the instructions are a bit vague. HOWEVER! I don’t mind vague instructions. Part of engineering is figuring stuff out. I eventually did figure it out, obviously, and continued to enjoy my time with the game. The graphics are exactly what they need to be for this type of game. I loved the fact that the skiers get all bloody when things go terribly wrong. In fact, the mechanics of the little characters apparently losing their lives made me laugh on many occasions because of the rag doll effects. Sometimes it’s actually more fun to fail just to see in what ways you can ruin the day of a snowboarder. I even like seeing my creation given a third dimension. Included in the graphics is a feature that changes the color of the pieces of structure that are under the most strain. They put the percentage at the top of the screen in a prominent place to give you a better idea of how close to failure it is. I even made a little game of my own where I tried to make each structure hit over 90% strain and still function. It makes for a much more hilarious time as you watch your little people topple with your structure. If you’re looking for a fun title that you can just pick up and play at a moment’s notice and for pretty much any mount of time, this title comes highly recommended for its problem solving and fun light hearted gameplay. I would also recommend it for kids to get them thinking about structural integrity and for those who express an interest in engineering later in life. There are a lot of extra little bits that make this one a must-have for builders and thinkers. It works very well whether you play on the television or on the Switch’s screen and a good title to steal away a few minutes and play in between other tasks. When Ski Lifts Go Wrong is an entertaining game with funny predicaments that are often caused by the way you build your structures. This engineering puzzle game will appeal to a wide range of gamers and is an excellent fit for the Switch.